Meadow Springs Ranch was a working ranch but since we've semi retired from ranching we now run Meadow Springs Mechanical and BCTractorParts.com. We make our own hay on the ranch and now that we've sold all of the cows we have lots for our horses and occasionally even have a little hay to sell, whereas before, most years we would end up buying hay by the semi load. The ranch is a quarter mile wide and one mile long, which is 160 acres, called a quarter section. The fences are mainly the typical log snake fences seen throughout the Cariboo. When out exploring one will often come across one of the older original "Russell Fences", and the occasional "stack yard". 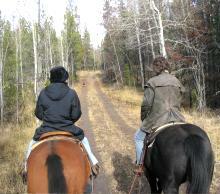 We did all of our cow work on horseback - the old fashioned cowboy way. Below you'll see photos at branding time, during round up, at haying time, of field re-seeding, and even a couple of us chopping holes in the ice to water the stock in the winter. 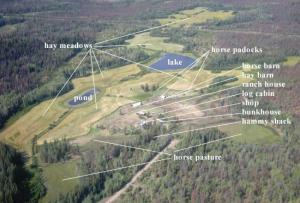 The photo above and to the right shows the layout of the ranch from the air. If you click on the photo it will enlarge and you'll be able to see the hay meadows, where the buildings are situated, etc. One of the old homesteads of the South Cariboo, the ranch is completely surrounded by Crown Land. 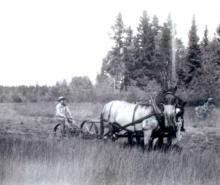 The photo to the left shows, what was then known as the Thompson Meadow, being hayed with a team of horses pulling a mower in about 1940. Some of the original Gold Rush Trail wagon road (photo to the right) that used to be the main road to Barkerville in BC's gold rush era crosses our road. This, and other trails and roads, make for endless adventure - be it by car, hiking, horseback riding, cross-country skiing, or snowmobiling. There are lots of trees, natural meadows, six year-round natural springs, and even our own private lake. After the photos of the work being done there are a couple of the relaxing side of life - like a couple of bulls hanging out in the shade, us and the dogs cooling off in the lake, one of the weddings that took place in our meadows, and a couple of camera crews that have been here to film Meadow Springs Ranch - the first is of Canadian Cowboy TV and the second is of a Norwegian TV crew doing a show on Canada to run while the Winter Olympics was on. These and many other photos can be seen on "Our Photos" page. Our closest neighbours are about five miles south, eight miles north, and forty miles west. This gives the feeling of being out in the wilderness. Although it seems private and isolated, it is only 10 minutes to 70 Mile House or 20 minute drive to 100 Mile House. On our map page you can see where we are located and get directions on how to get here. Designed and built by Web Site Design - web sites built for search engine results.